If you use the Pinterest app on your mobile phone, you may have been prompted to download the recent upgrade. While previous Pinterest upgrades have fixed minor issues or made minor tweaks, this latest upgrade has stepped up its game. 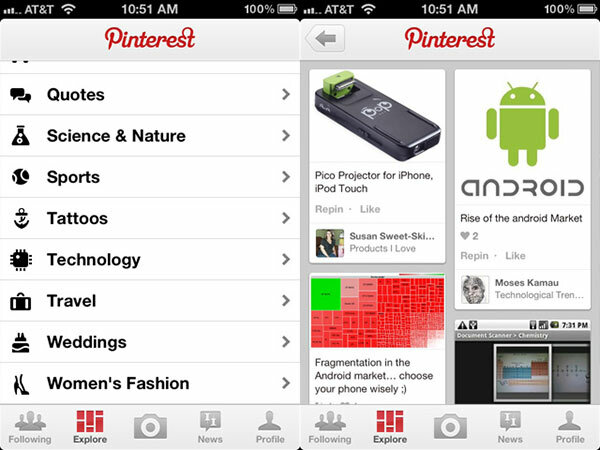 On Wednesday, August 15, 2012, Pinterest announced that its iOS received an upgrade to version 2.0, which came with many changes to the newest social network. If you’ve installed the upgrade (or even if you have yet to do so), the following is a snippet of some of the changes you’ll notice. If you like to look at the pins your followers have posted, you may have been annoyed with the one column view that was previously used. Scrolling through all of the pins was time consuming. 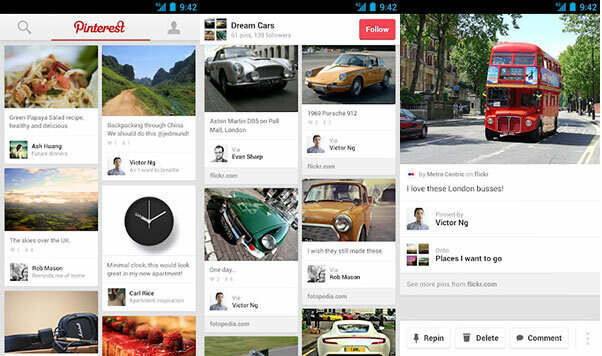 Now, Pinterest has switched to a two column view. Though the images are slightly smaller, it allows you to see more posts at a time, which makes browsing much easier. When you tap on the image, you will be able to see a larger picture of the item; the people who have liked, repinned or commented on the image; and you can even leave your own comment. The two column view has also been extended to the categories themselves. Before, a category was a jumbled mess of pictures, and you would need to click on them in order to gain information as to what they were. Now, the categories also use the two column format, and you can also see who posted it, as well as how many people have liked it, commented on it and repinned it. Another change in the 2.0 upgrade is the amount of categories available. Everything from quotes to animals to geek to tattoos can now be found in its own Pinterest category. There is also a Popular category that will show you the most popular pins for that day. 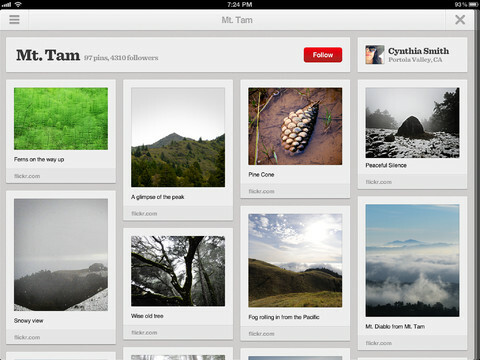 The upgrade to Pinterest made the app available on the iPad. The app works in landscape mode and uses a three column format instead of a two column format. The functionality of the iPad app is also a bit different from the mobile app, as the menu items appear on the side of the screen instead of along the bottom. The upgrade has also made the Pinterest app available on Android devices, including mobile devices with numerous screen sizes as well as tablets. Buttons to access information on the app are located along the top of the screen instead of the bottom like on the iPhone app, and the tool to take a picture is hidden in a drop down menu. Android users have the option of using the app in portrait or landscape mode. If they opt to use it in landscape, it will add a three column view instead of the two column view found in portrait. The purpose and overall concept of the app has remained the same, but it has made some upgrades to make it more aesthetically pleasing to users and make it available to a wider audience. Most people have enjoyed the features of the new upgrade, and we’ll be interested to see how making it available for Android and iPad will increase the social network’s popularity. Is Facebook Causing Us Too Much Stress?